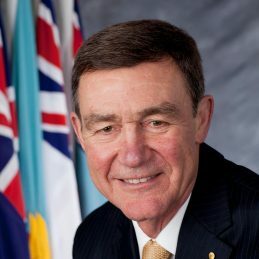 Sir Angus is Chancellor for the University of the Sunshine Coast and is Chair of Airservices Australia; the Defence South Australia Advisory Board; the Order of Australia Council; the Sunshine Coast Mind and Neuroscience Thompson Institute; the Victorian Police Corporate Advisory Group; the University of NSW Canberra Advisory Board; the Canberra Symphony Orchestra and the Supashock Advanced Suspension Advisory Committee. He is a Board Member of the Lowy Institute for International Policy, the Australian Cancer Research Foundation, the Anzac Centenary Public Fund Board, GreaterGood Canberra and the Victorian Police Executive Command. In addition, he is the Ambassador/Patron of numerous charitable organisations. These include Bravery Trust, the Bomber Command Association in Australia, the European Alliance Against Depression Australian Chapter, Griffith University’s Glycomics Childhood Leukaemia project, Soldier On, Stand Tall for PTSD, Sunnyfield Disability Services, Shelterbox Australia and The Centenary of Anzac Centre. In 2012 Sir Angus led the Expert Panel on Asylum Seekers. Sir Angus was Chair of the Anzac Centenary Advisory Board from July 2011 until March 2014. The Board provided strategic advice to the Government on the national program for the Anzac Centenary 2014 – 2018. In July 2011 Sir Angus retired as Chief of the Australian Defence Force after 41 years of service in the military. Sir Angus was awarded the Degree of Doctor of the University, honoris causa from UNSW in November 2015 and the Degree Doctor of Laws honoris causa from ANU in December 2016.